Vallow's back and the Carolina RailHawks are in town. - Steven Goff, Michael Wilbon, and the rest of the crew at the Washington Post are all over DC's 1-0 win over the LA Galaxy last night. Well, that's likely because of the fact that a certain English midfielder made his MLS debut last evening for LA. And by all the pictures that were taken, everyone knows who it was. The only problem now is that we are going to have to endure the soccer haters saying that Beckham is a fraud because he didn't win the game for LA despite the fact that he entered the match on the road and with LA down a goal and a man as Kyle Martino got red carded literally seconds before Beckham was to come into the game. - Benny Feilhaber has his UK work permit, thanks to a glowing recommendation from USMNT head coach Bob Bradley, so his move to Derby County should happen within the next day or so. NY Red Bulls assistant, and former Derby County player, John Harkes has talked up the young Yank to the locals, as well. If Eddie Johnson had accepted Derby's offer, they would have been on their way to a little Reading or Fulham American invasion. - The NY Times.com soccer blog GOAL has a Q&A with William Gaillard, UEFA's Public Affairs Director, about the fight against racism at soccer matches throughout Europe. This topic is once again in the news after verbal attacks against DaMarcus Beasley during a recent Champions League qualifier. - Apparently there are some fans that want Fernando Clavijo gone as the head coach of the Rapids. - US Soccer.com has a Q&A with new US U-23 MNT head coach Peter Nowak. - The USWNT faces New Zealand on Sunday from Soldier Field in Chicago and the game will be on ESPN2. - Everything you needed to know about Rob Stone and then some from Goal.com . - Ives Galarcep is reporting that Danny Szetela's move to AS Roma could happen before the end of the 2007 MLS season. - The NJ Ironmen will make their indoor soccer debut on December 1st versus the Detroit Ignition. The question now is will Tony Meola, Scott Palguta, and Kenney Bertz be playing for the expansion team? 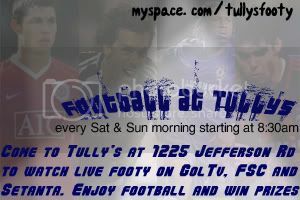 - And finally, if you are a fan of the English Premier League, I'd suggest heading out to Tully's on Jefferson Road in Henrietta this summer as they will have GolTV, Fox Soccer Channel, and Setanta Sports on their TVs to give you more footy action than you can get anywhere else. Setanta's EPL schedule for this weekend features Sunderland v Tottenham and Bolton v Newcastle on Saturday and Chelsea v Birmingham City on Sunday. FSC will have a Saturday triple header of West Ham v Man City, Aston Villa v Liverpool, and Derby v Portsmouth. And on Sunday it is Yanks Abroad day on FSC with Arsenal v Fulham and ManU v Reading.